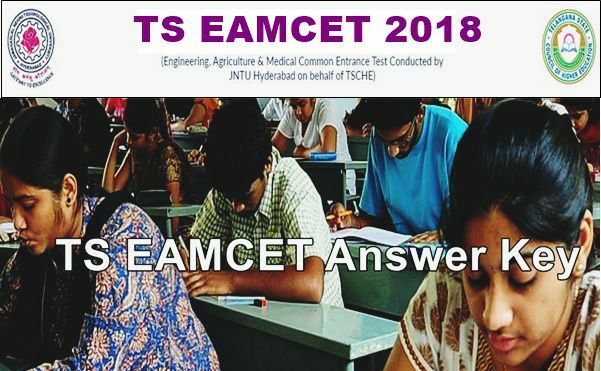 TS EAMCET Answer Key 2018: Telangana EAMCET Exam 2018 Answer Key & Response Sheets for Engineering, Agriculture and Medical will be published by the authorities in the official website for the TS EAMCET From 8th May available at eamcet.tsche.ac.in. Jawaharlal Nehru Technological University Hyderabad (JNTUH), has taken the responsibility to conduct EAMCET (Engineering Agricultural and Medical Common Entrance Test) in the state of Telangana, on behalf of Telangana State Council for Higher Education (TSCHE). Annually lakhs of students from across the state have taken part in the exam for getting admission in to the Engineering, Agriculture and Medical courses. Now, all those candidates who have participated in the exam are eager to check their respective set wise eamcet answer keys in order to verify the answers and to know whether they have been qualified in the exam or not. For all those candidates who are waiting for the TS EAMCET Answer Key 2018, it is said that JNTUH along with TSCHE will be issuing in the official website. Though the exact date it not yet known, it is expected that within two to three days after the completion of the exam, the conducting boards will release the answer sheets for helping the candidates verify the answers. So, candidates can wait few days after completing the exam and soon after we get the update, you can get the answer key here. Every year, Jawaharlal Nehru Technological University Hyderabad on behalf of TSCHE will conduct the Telangana State Engineering, Agriculture and Medical Common Entrance Test (TS EAMCET) for giving the admission into different professional courses that will be offered in University or Private Colleges of the Telangana state for all the qualified eligible candidates in the exam. As a part of it, this year notification has been released by the conducting authorities for the TS EAMCET 2018 and it got huge response from all the candidates who wanted to get admitted in the above mentioned courses. All those candidates have successfully completed the exam and are waiting for the Telangana EAMCET 2018 Answer sheet now. Please find attached here with Preliminary keys of TS EAMCET – 2018 for both the streams. 1. Objections if any may be submitted through online mode only. 2. Objections submitted any other format will not be entertained. 3. Objections should be substantiated with proper justification. TSEAMCET-2018 is being conducted in multiple sessions based on the same syllabus, same pattern for candidates having same eligibility criteria. A candidate will be eligible to appear only in one session. Since the question paper is different for each session, there is a possibility that the candidates may compare themselves about the variation in the difficulty levels of question paper of the same subject. However, it may be noted that utmost care will be taken so that all the subjects are of the same standard. Further, it is decided to adopt a normalization process to eliminate any such variations in the difficulty levels of various sessions. The qualifying percentage of marks for the TS EAMCET-2018 is 25% of the maximum marks considered for ranking. However, for candidates belonging to Scheduled Caste and Scheduled Tribe, no minimum qualifying mark is prescribed. But their admission will be limited to the extent of seats reserved for such categories. How to Download the Telangana EAMCET Answer Key 2018? On the homepage, you can find the TS EAMCET 2018 answer key download link in the appropriate section. Click on Engineering Stream Answer Key for downloading the engineering paper answer sheet and for Agriculture as well as medical paper answer key, they can click on the respective answer sheets. Finally, the answer sheets will appear on the screen set wise. You can download them on your computer and refer the answers. 1.3 How to Download the Telangana EAMCET Answer Key 2018? This is srilekha sudda.can you pls tell me how to register and where to register for eamcet counselling.what are the certificates needed for registering it.